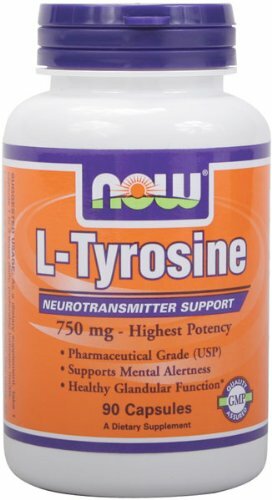 Dr. Slagle has personally taken tyrosine every day since 1973 to maintain a healthy mood. Since 1973, she has not had 1 day of low moods. If you are taking any prescription or over-the-counter medicine be sure to check with your doctor and the Physician's Drug Reference to see if depression is a potential side effect. You would be surprised how often it is! If so, talk to your doctor about a change to a non-depressing drug when possible or try to override that effect by following Dr. Slagle's complete & safe program for the natural treatment of low moods. Contraindicated with known or pre-existing melanoma, as tyrosine can also convert to melanin. 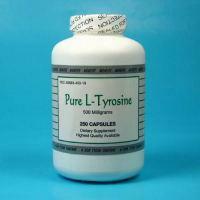 Contraindicated when you have an over-active thyroid, which is much less common than an underactive thyroid. With meals-be sure to be taking a good multi vitamin mineral. 1-3 doses 2400mg - 3000mg per dose daily 1st dose upon arising on an empty stomach at least 1/2 hr or more before eating but may use with fruit - just no protein. If not adequate results after 1 week can add 2nd dose mid morning between meals. 3rd dose can be added mid-afternoon between meals if not adequate results after 1 more week. 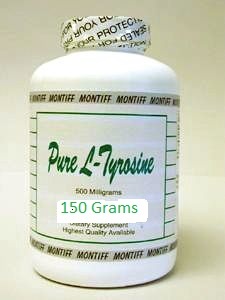 With each dose of tyrosine take 1 Pyridoxal-5-Phosphate.